By Dan Ambrose: Former middleweight world champion Danny Jacobs (32-2, 29 KOs) will be fighting on October 14 against an opponent still to be determined on Premier Boxing champions on Fox at the Barclays Center in Brooklyn, New York. Jacobs says he would like to fight the recently beaten Julio Cesar Chavez Jr. Jacobs says he’ll fight Chavez Jr. at whatever weight he feels comfortable at. He’d be willing to fight Chavez Jr. at light heavyweight at 175 pounds if that’s what he wants. Of course, there are some boxing fans who believe that Jacobs rehydrated to 190 lbs. for his last fight against Gennady Golovkin. Fighting at 175 should be a cinch for Jacobs. He might have to lose weight to make 175. It’s unlikely that Chavez Jr. will fight Jacobs by October 14. If Chavez Jr. is going to fight, he’ll need time to get his weight right. It’s been a little over 2 months since Chavez Jr. was soundly beaten by Saul Canelo Alvarez on May 6. It’s quite possible that Chavez Jr. has put on a lot of weight since then. 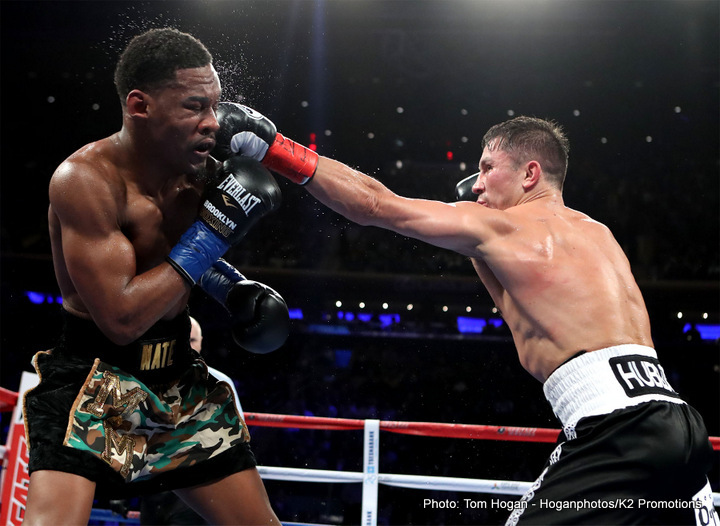 This is the first fight for the 30-year-old Jacobs since his loss to middleweight champion Gennady “GGG” Golovkin earlier this year on March 18 on HBO pay-per-view. Jacobs is still not quite over that loss, as he’s still droning on like a broken record about how he thought he should have been given the victory. The judges didn’t feel the same way though, as they gave the victory to Golovkin by a 12 round unanimous decision. The scores were 114-113, 115-112 and 115-112. “We’re going to get the rematch,” said Jacobs to ES News Reporting about a second fight against Golovkin. “We got a date coming back, October 14th at the Barclays Center. We don’t have the opponent yet though, but we’re working on that. We should have something,” said Jacobs. It’s doubtful that Jacobs will fight anyone talented. Jacobs’ pattern is to take on 2nd and 3rd tier fighters in between big fights. Even as the WBA World middleweight champion, Jacobs wasn’t fighting big names. He was defending his title against fighters like Caleb Truax, Sergio Mora [twice] and Peter Quillin. The fight against Quillin was actually a good fight for Jacobs. He stopped him in the 1st round. Jacobs says that Quillin hits harder than Golovkin, even though he says wasn’t hit by him during the fight. Jacobs says one of Quillin’s punches sailed over his head, and he felt that he was a harder puncher than GGG by the way the punch whished by him. To be honest, I’m not sure if that’s a sound way to gauge how hard someone hits, but that’s Jacobs’ method. Jacobs seems be guessing that Quillin hits harder than Golovkin. Jacobs’ opponent for his October 14th fight could be anyone. It would be nice if it’s a contender that he faces. However, before Jacobs won the WBA title in 2014, he was fighting these guys in his 3 fights before challenging for the title: Milton Nunez, Giovanni Lorenzo and Keenan Collins. Nunez and Collins were journeyman. My guess is we’ll see Jacobs fighting a journeyman on October 14. I don’t think Lorenzo is still around, so we probably won’t see him again as opponent. Jacobs fought Sergio Mora twice, so you never know if he’ll go the retread route. ”I could fight him,” said Jacobs about Chavez Jr. “He gave me credit for beating Triple G, one of the best middleweights in the world. So he wants to fight me. I think it’s a good fight. That’s something I want to do, and something the fans want. Chavez is a really good fight. I believe I can stop Chavez and really beat Chavez. I just don’t want it to hurt my career. I want to come back and have something exciting. I’m down to fight Chavez. If he’s willing to do I, send the papers. We’ll see what happens. At whatever weight he feels comfortable – any weight. It doesn’t matter, because this is a specific fight. It isn’t like I’m going up to 175 or 168 and staying there. I can fight this guy at any particular weight. Just so you know, Chavez, there is no excuses. I can fight you at any particular weight,” said Jacobs. I wouldn’t call Jacobs vs. Chavez Jr. an “exciting fight.” You could call it a ‘mismatch,’ but definitely not an exciting fight. I don’t know if Jacobs has been following the news in the last could of months in the boxing world, because he should have known by now that Chavez Jr. was easily beaten by Saul Canelo Alvarez on May 6. It wasn’t just that Chavez Jr. was beaten. It was how poor he looked in losing the fight. He looked really bad. He threw very few punches, and looked incredibly weak at the weight. Chavez Jr. had the appearance of someone that had taken too much weight off during training camp. He said he started camp at around 230 pounds, and had to drain down to the 164 ½ lb. catch-weight for the fight. Why Canelo and Golden Boy Promotions insisted on a catch-weight for the fight is unknown. It was already a mismatch. They didn’t need a weight advantage too by having Chavez Jr. weight drained. Canelo got his win, and I’m sure they’re pleased about that. But the fight turned out to be terrible because of Chavez Jr. being so weight drained. Oscar De La Hoya blamed Chavez Jr. afterwards by saying he “didn’t show up” to make it the exciting fight that Golden Boy had advertised it to be. De La Hoya should have taken responsibility for the fight being so bad by acknowledging that he made a mistake in asking Chavez Jr. to fight at a catch-weight of 164.5 pounds, and then attaching a weight penalty. They should have let the fight happen at 168 or 172, whatever weight that Chavez Jr. could come in at. The weight penalty shouldn’t have been part of the fight. I wouldn’t have done that if I was De La Hoya, because I would have known how it would have negatively affected Chavez Jr. by having him take off too much weight. “90 percent of the people I come in contact with or read or do my own research about really felt like I won the fight,” said Jacobs about his fight against Triple G. “For me that makes me feel good that I put in my best effort. People still find me as the winner. I want to see what momentum I can have from that fight,” said Jacobs. Jacobs still hasn’t mentally digested his loss to Golovkin. Jacobs needs to get over it already. My suggestion would be for Jacobs to watch the Golovkin fight in slow motion as I did, and then he’ll see all the shots that he thought he was landing, they were getting picked off on the gloves of GGG. Jacobs needs to see the head-snapping jabs that Golovkin was landing all throughout the fight. More importantly, Jacobs needs to watch the 4th round and see how he was knocked down by Golovkin. That wasn’t Golovkin that was knocked down. Jacobs should move on and try and learn from his loss. Maybe in his next fight, he’ll make sure he doesn’t get dropped, and he’ll fight harder in the first 6 rounds. Jacobs gave away that Golovkin fight by running around the ring in the first 6 rounds. Instead of fighting, Jacobs was running. He was obviously following the Kell Brook blueprint I how to fight Golovkin, and he fell into the same trap as Brook in losing. “I’d say about 8,” said Jacobs when asked how hard Golovkin hits on a 1 to 10 scale. “I’ve sparred guys, and I’ve been hit by bigger, harder guys,” said Jacobs. ”Peter Quillin hits hard. Triple G hits hard, but he’s not the most devastating knockout artist that everyone has portrayed him to be,” said Jacobs. Golovkin might not be the hardest puncher in the middleweight division. He seems to have good enough power to knockout most guys. Being able to hit hard doesn’t mean you’re an elite fighter. Look at Quillin. Jacobs says he hits harder than Golovkin, and yet he was knocked out in the 1st round by Jacobs. It’s good to hit hard, but if you can’t take a punch or if you can’t get out of the way of a jab, then you’re going to lose. That was Jacobs’s problem against Golovkin. He got knocked down in the 4th round. Jacobs couldn’t defend against Golovkin’s jab. That was a power jab, not a weak one. Golovkin was able to hit Jacobs with that power jab in round after round, and it was hard for the judges to ignore the way that Jacobs’ head was snapping back each time he was hit. “It’s a very interesting fight,” said Jacobs in discussing the Canelo-Golovkin fight. “I’ve always felt strongly with whoever the bigger, stronger fighter will prevail, because they both have a come forward style. If Canelo can make those adjustments, because he’s the smaller guy, and if he can take those punches, then it’ll be an interesting fight. But if he can’t take those punches, then it’ll be just a matter of time. Of course, I want the winner. Well, I’ve got my eye on Triple G obviously,” said Jacobs in saying he wants the rematch with Golovkin. It goes without saying that if Canelo can’t take Golovkin’s punches, then he’ll get stopped. It’s surprising that Jacobs isn’t making a pick in that fight. In the past, Jacobs picked Golovkin. I wonder what caused him to not to pick him this time. As far as Jacobs getting the winner of the Canelo-Golovkin fight, it’s not going to happen. That’s a pipe dream on Jacobs’ part. Golovkin and his promoter Tom Loeffler have already said that they would like a rematch with Canelo. Even if they beat him on September 16, they want a rematch. If Canelo and Golovkin don’t face each other 2 to 3 times, then Golovkin will move on and look to win the WBO title if he’s successful against Canelo. After that, Golovkin will be moving to super middleweight. I’m not sure that Jacobs figures in Golovkin’s future unless he moves up in weight to fight at 168. I don’t think Golovkin will want to slow his career down by fighting Jacobs at 168. Golovkin will want to fight for the world titles at super middleweight. If Jacobs can plan ahead and move up in weight to the 168lb division right now, then he could position himself to get a rematch with GGG if he can win a world title in that weight class. “He’s still considered one of the best middleweights, and he’s still considered the best, and I want to prove to the world,” said Jacobs in continuing to talk about the GGG rematch that he’s hoping for. “I really feel like I did, but now I really want to have my opportunity. I don’t want to sound like a broken record where all I want is a rematch. We have options. October 14 is going to be a really great opportunity for us. We’re moving in the right direction. We have a whole bunch of opponents that we’re choosing from. The show is not going to stop with Triple G. If he doesn’t want to do the fight, if he doesn’t want to prove himself to the world, the controversy and put all that to the side, then I’ll move on with my career,” said Jacobs sounding like a broken record. Jacobs should let go of his loss to Triple G and learn from it. It doesn’t sound like Jacobs has gotten over it yet. This could be an opportunity for Jacobs if he learned from the defeat, but it sounds like he’s in denial. Next time Jacobs fights, he needs to make sure he fights hard in the early rounds. He also needs to put up his guard to try and block his opponents’ jabs. Jacobs should stay away from the ropes, and stop switching to southpaw. Jacobs was knocked down when he got caught trying to switch from orthodox to southpaw. He was trying to be clever and he got dropped. Jacobs hits hard enough to where he doesn’t need to use cheap gimmicks like changing stances to win fights. That’s just a bunch of junk that won’t help him. Jacobs could have changed stances all night long against Dmitry Pirog in 2010, and he still would have been knocked out.